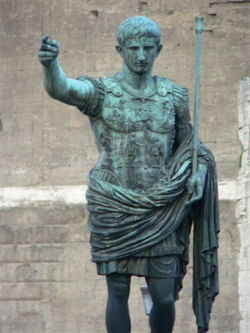 Bronze statue of Augustus in Rome. Gaius Julius Caesar Augustus Octavianus (63 BC - r. 30 BC - 14 AD) was the first Emperor of Rome and one who played a minor but key role in the Birth of Jesus Christ. The cognomen Augustus also appears as part of the name of every Roman emperor after this man, who also was known as "Augustus Caesar" and "Caesar Augustus." He was born Gaius Octavius the younger, son of Gaius Octavius the elder and Atia, daughter of Marcus Atius Balbus and Julia Major, sister to the great Julius Caesar. His birth took place on September 23, 63 BC according to the old Roman calendar, in the year of the consulship of Marcus Tullius Cicero and Gaius Antonius Hybrida. His grand-uncle Julius Caesar had been elected Pontifex Maximus in that year. Shortly after the young Octavius was born, Gaius Octavius senior gave him the cognomen Thurinus in honor of his victory at Thurii over a slave revolt. In 59 BC (in the consulship of Julius Caesar and Marcus Calpurnius Bibulus), Gaius Octavius senior fell in battle. Atia then married a second time to Lucius Marcius Phillippus, a prominent consular Senator with ties to both of the warring political factions in the Senate at the time, the optimates (including Bibulus and Marcus Porcius Cato the younger) and the populares (led primarily by the First Triumvirate of Julius Caesar, Marcus Licinius Crassus, and Pompey the Great). Octavius gained his majority at fifteen. Even before then, he had impressed his grand-uncle Caesar by his remarkable political wisdom and wit. Shortly after putting on the plain white toga virilis (literally, gown of manhood), he won election to the College of Pontifices. He joined Caesar's staff as contubernalis, or personal cadet, at the age of seventeen (46 BC). Caesar was fighting Pompey's remnants, commanded by Pompey's two sons, in Further Spain at the time. Octavian tried to join him there but fell ill, probably with the severe asthma that would plague him throughout his life. After he recovered, he set sail for Further Spain, but was shipwrecked along the way. He had to cross enemy-held ground to reach Caesar's camp, a feat that impressed Caesar even more greatly. Caesar won against the Pompeys and returned to Rome. There Caesar made perhaps the most critical decision of his life: in deciding who ought to inherit his tremendous wealth and influence, he chose the young Gaius Octavius and not the man more near Caesar's age, Marcus Antonius. Octavius had gone to Greece with the huge army that Caesar was then raising to march against the Kingdom of the Parthians. Word then reached that camp that Caesar was dead--murdered in the Curia Pompeia by a conspiracy of twenty-four Senators, on the Ides of March (March 15) in 44 BC--and that he, Octavius, was now Caesar's adopted son and heir. The young man, now known as Gaius Julius Caesar Octavianus, quickly surrounded himself with loyal officers among the legates and tribunes who had been waiting for the Parthian campaign. He also, in another critical decision, appropriated and secreted away the war chest before Antony could seize it himself. Antony was furious at losing out of Caesar's inheritance, and raised an army of his own. Eventually the two men, and a third man (Marcus Aemilius Lepidus), met in Italian Gaul (or more particularly, "Gaul on the Near Side of the Alps") and discussed terms. These discussions led to the Second Triumvirate among these three. With the final defeat of the "Kill Caesar Faction," the three men divided Rome's provinces among them. Lepidus received Africa and the islands, Octavian received the Spains and the Gauls (Gaul of the Longhairs, Italian Gaul, and the Roman Gallic Province, called "Provence" today), and Antony won control of all remaining lands. Technically, Rome and Italy (specifically southern Italy, the territories of the Italian Allied States) were to be the joint responsibility of the three. In actual practice Octavian managed Rome and Italy himself, since the other two were away. Octavian settled the veterans of the triumvirate's campaigns on property he confiscated from Italian Allied subjects. Eventually Octavian won over all of Lepidus' troops and thus forced him out of his command; Lepidus had to content himself with the office of Pontifex Maximus to which he had been elected after Caesar's death. Octavian then (in 41 BC) divorced Clodia Pulchra, daughter of Antony's wife Fulvia Bambalionis by her first husband, Publius Clodius Pulcher. He did this to marry Scribonia, a member of the extended family of one of Caesar's original allies, by whom he had his only child, named Julia. Fulvia, enraged, goaded Antony's brother Lucius Antonius into raising an army to fight for the rights of the Antonii. Octavian chased this army out of Rome and defeated it at the seige of Perugia in 41-40 BC. Fulvia went into exile at Sicyon and died there; some accounts suggest suicide. Ironically, when Julia was born, Octavian then divorced Scribonia to marry Livia Drusilla, a member of the family of Marcus Livius Drusus, a famous tribune-of-the-plebs who had been murdered during the quarter-century of strife between Gaius Marius and Lucius Cornelius Sulla Felix. Of note is that in 38 BC, Octavian stopped using his old given name of Gaius and began calling himself Imperator Caesar Divi Filius (Field-marshal Son of the Divine Caesar), in reference to the act of the Senate recognizing the dead Caesar as a god. The title of Emperor developed from this practice. That Octavian and Antony would eventually come to blows was perhaps inevitable. Antony was by all accounts a wastrel and a very poor administrator, and was constantly short of money; this led him to seek an alliance with Cleopatra VII, who had formerly been Caesar's lover and had borne his one natural son, Ptolemy XV Caesarion. Octavian tried one last time (40 BC) to bring about a reconciliation: he invited Antony to join him at Brundisium (modern Brindisi), and there insisted that Antony marry his sister Octavia. But three years later (37 BC) Antony deserted Octavia and installed himself in Alexandria to be with Cleopatra. Thereafter Octavian continued to build his power base and to spread propaganda, both in the Senate and among the people, to the effect that Antony was becoming less Roman and more Egyptian every year. The final impetus came in 32 BC when Octavian read before the Senate a document, which he stated was Antony's will, which stated that when he was dead, he wished to be buried in Alexandria. The Senate promptly declared war on hearing this. The war was short: Octavian's naval forces, under the command of Marcus Vipsanius Agrippa, defeated Antony's ships off Actium, and Antony deserted his own troops and fled the scene with Cleopatra. Octavian pursued them all the way to Alexandria, where they both committed suicide (30 BC). Octavian killed Ptolemy Caesarion and also killed the children of Antony by Fulvia--but he let Antony's children by Octavia and Cleopatra live. Among these was that Antonia Major who was the mother of the future Emperor Claudius. Octavian carefully preserved all the outward forms of the Roman Republic. But this fooled no one; Octavian was an autocrat and a monarch in all but name. In 27 BC the Senate granted him the titles of Augustus ("the enlarged") and Princeps (First Citizen, or in this case, Head of the Senate). From that point on, the head of the Roman state was always called the Princeps Senatus, and the proper name for an emperorship was principate. In 23 BC Augustus assumed all the powers of a tribune-of-the-plebs, now called "tribune of the people." He also assumed the powers of the censor, and by that power could make and unmake Senators and also call a census of the people of Rome and the subject peoples of the provinces. Augustus is best remembered in the secular literature as a master builder. In fact, Rome today has many buildings that date from his emperorship, though most of these (like the Pantheon) bear the name of Agrippa, his old admiral and for a time his best and most loyal administrator. Augustus also instituted a number of important revenue reforms, including the abolition of private tax-farmers (publicani) in most of Rome's territory and the creation of a direct, salaried civil service force to carry out tax collection. Indeed, Augustus may be said to have invented or perfected many institutions of modern statecraft, including the civil service, the vesting in the executive of the power to summon a legislature and to veto its acts, and arguably the systematic use of espionage in warfare. Saint Luke records (Luke 2:1-2 ) that Augustus took a major census in the year when Quirinius was "in charge" of Syria Province. This Quirinius was probably Publius Sulpicius Quirinius. Under the procedures of the census, everyone needed to return to the city of his ancestors in order to enroll. Joseph of Nazareth and his wife Mary traveled to Bethlehem to enroll--and while they were there, Jesus Christ was born. Augustus' efforts to decide on a successor were marred when those he chose kept dying. Most accounts lay the blame squarely on Livia, who always sought to secure the succession for her son succeeded by::Tiberius Claudius Nero. Ultimately, when Tiberius was the only man left, Livia poisoned Augustus. He died in 14 BC, and Tiberius did indeed reign in his stead. Augustus by "De Imperatoribus Romanis"
This page was last modified on 4 April 2009, at 02:31.